Seventy-seven were put in an intervention group and given height-adjustable workstations - also known as sit-stand desks - while the remaining 69 continued with their standard desks. A questionnaire filled out by the participants also suggested employees who used the sit-stand desks were less anxious and cited an improved quality of life - but no notable changes were found for job satisfaction, cognitive function or sickness absence. Medical research has suggested constant sitting is harming our health - potentially causing cardiovascular problems or vulnerability to diabetes. 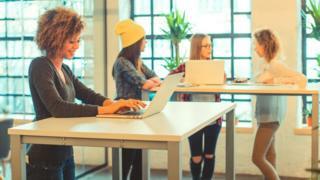 In Sweden, sit-stand working is commonplace - and in 2014, Denmark made it mandatory for employers to offer their staff sit-stand desks.